I really love author Courtney Summers but I just don't love zombie books. Sloane Price is one of 6 students who is barricaded in her high school when the world has ended and the zombies are trying to get into the school. Everyone in the high school wants to live but they do not know that Sloane has a pact to die and she is just biding her time until she can take her own life. Why? Her sister, Lily ran away 6 months ago and she promised she would take Sloane. Why? Their misreable father maliciously beats them on a daily basis and Lily was going to run with Sloane to a better life and then Lily ran away and the apocalypse struck! What happens inside the school is totally creepy and scary, I couldn't put the book down. I liked watching characters who gradually stepped up and changed during their time in the school while others deteriorated, turned on others and were just palin human during a truly terrifying time. I so enjoyed watching Rhys become someone Sloane grew to care about; Rhys knew how to handle Sloane (even when he found out she wanted to kill herself)and it was totally maniacal when they decide to run "outside" and make it to a center for aid. Summers does not allow the reader any time to think in this book because there is constant paranoia, dread, and fear. Intense and utterly scary, what will happen to Sloane? 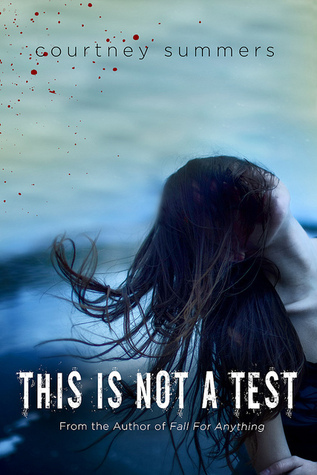 Sign into Goodreads to see if any of your friends have read This is Not a Test.